Pabst Sunday Supper Success Ad 1934 This is a May 1934 advertisement. It is a nice color ad from Pabst Blue Ribbon Beer. Pictures a young woman in maids uniform serving food to adults and it is titled, A Sunday Supper Success. Of course, they are also holding a glass of Pabst. Colors and borders in this picture are very nice. In mint condition. This photo is taken through plastic and may show wrinkles or crookedness that is not in the ad. This magazine tear sheet measures 8 1/2"" wide by 11 3/4"" tall. 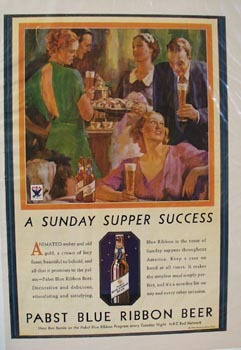 Items Similar To "Pabst Sunday Supper Success Ad 1934"